Liver cancer is a devastating disease that is characterized by a high risk of recurrence and limited treatment options. The average survival after diagnosis is roughly from 6 to 20 months, depending on the stage at diagnosis. Preclinical animal models are potent tools in liver cancer research for selecting drug candidates for clinical development. The SK-HEP-1 epithelial cell line was isolated from the ascitic fluid of a 52-year-old Caucasian male patient with adenocarcinoma of the liver in 1971 by G. Trempe and J. Fogh. Tai et al. released a 2018 study outlining the use of SK-HEP-1 as liver sinusoidal endothelial cells rather than hepatocellular carcinoma cells as a reflection of their gene expression, protein levels and morphological phenotype (tubular formations, fenestrae with no diaphragms) which is important to consider when selecting a cell model for your research. This is also reflected in the study by Eun et al. (2014) demonstrating the SK-HEP-1 model to represent a unique mesenchymal to stem cell transformation, as the cells do not exhibit expression of liver specific transcripts, with metastatic potential. Prior to this a 2014 article published in Oncogene, demonstrates that the SK-HEP-1 xenograft model is suitable for examining tumor growth and metastasis simultaneously. 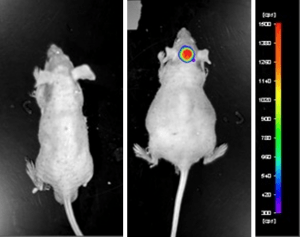 The study indicates that Zcchc11, a repressor of let-7 maturation, promotes tumor growth and metastasis in vivo and is overexpressed in human cancers, which has implications to develop new strategies for cancer therapy. A 2015 Molecular Oncology article (Hou et al.) used the SK-HEP-1 xenograft model to demonstrate that the plasma membrane protein gp96 is associated with poor prognosis in hepatic cell carcinoma (HCC) because it regulates a uPAR-mediated increase in growth, survival and invasion (and decrease in KDELR1, an ER receptor). Data also demonstrated that siRNA targeting of the mgp96 and uPAR interaction decreases tumor growth and metastasis, supporting this interaction as a target for cancer therapy and eventual disease free survival (DFS). Clinical Cancer Research released a 2014 article by Xiang et al. using the SK-HEP-1 xenograft model to characterize the mechanism of anticancer action of the MET and VEGFR2 inhibitor cabozantinib as a potential way to overcome resistance to adjuvant treatment with sorafenib. Cabozantinib treatment demonstrated a decrease in angiogenesis, proliferation and an increase in apoptosis. The SK-HEP-1 cell line (human liver) is used to create the CDX (Cell Line Derived Xenograft) SK-HEP-1 xenograft mouse model. The SK-HEP-1 xenograft model is utilized in monotherapy studies or in combination antitumor activity studies of sphingosine kinase 2 inhibitors (e.g. ABC294640) in combination with sorafenib (mechanism of action thru suppression of MAPK pathway; decreased levels of phosphorylated ERK). SK-HEP-1 cells are trypsinized while under exponential phase growth. Trypan blue is used to determine viable cell counts. The total cell suspension concentration is adjusted to the necessary density for injection. Athymic BALB/C or NOD/SCID mice (10-12 w.o.) receive a single, subcutaneous injection (s.c.) in one hind leg containing 1 x 106 cells (vol = 100 µL of Matrigel + SK-HEP-1 suspension). Palpation of the injection sites are performed three times weekly to determined tumor establishment. Tumors are calipered to monitor progression of tumor growth until a size of 50-150 mm3 is reached. Animals are sorted into cohorts and the test material is administered. Tumors are monitored (daily measurements) along with mouse body weights logged. The in-life portion of the study is reached when tumor size reaches 2,000 mm3 (or the study size limit per approved IACUC protocol). Necropsies are performed and tissues are collected. Tumors are weighed and digitally imaged. As directed by the client, collected tissues can be frozen, prepared for histology or nucleic acids isolated.